Today I have a congratulations card to share. 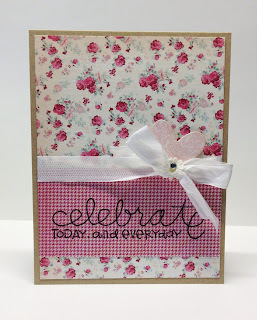 The sentiment is from Paper Smooches and the flower die is from Papertrey Ink. The flower center is a button die from My Favorites Things and the leaf die is from Clear and Simple Stamps. The papers are an older paper pad from K & Company. 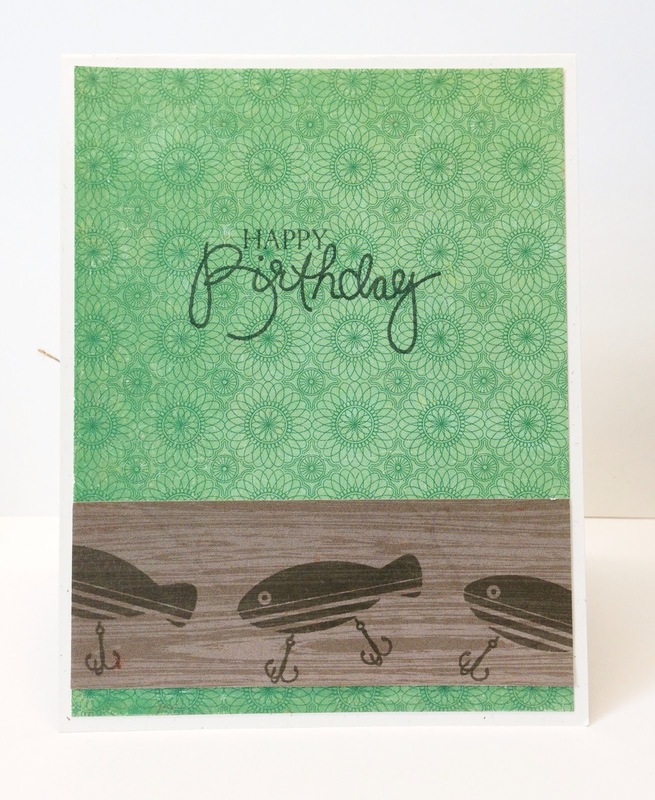 Just a quick post today to share a simple masculine birthday card. 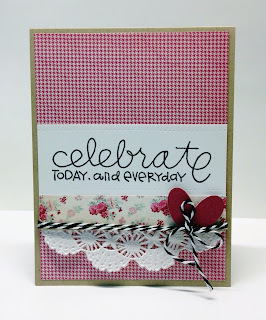 The bear is from an old retired Stampin Up set and the happy birthday sentiment is from Paper Smooches. The patterned papers are from My Mind's Eye. I added a strip of scalloped black cardstock and some twine to give it a little detail but keep it manly. Today I have two more cards that use the Blush papers from the My Mind's Eye Lost and Found 2 collection. They also use a sentiment from Paper Smooches Pretty Phrases and a heart die from Clear and Simple Stamps. Thanks so much for stopping by. I hope you're having a great week. Happy Stamping! Today's card uses the Love Me papers from My Mind's Eye. I stamped the LOVE sentiment from Paper Smooches Good Gab set on a tag, colored the heart with a Copic and then added diamond glitter from AMuse Studio by using a Quickie Glue pen. The stripes on the bottom of the tag are washi tape. I went with a black card base to tie in the black polka dot washi tape and ribbon. I think this will be a fun Valentine's Day card to send out. How about another birthday card today? This one has a little bit of everything. Papers are from the My Mind's Eye - Stella and Ruby - Gertie collection. 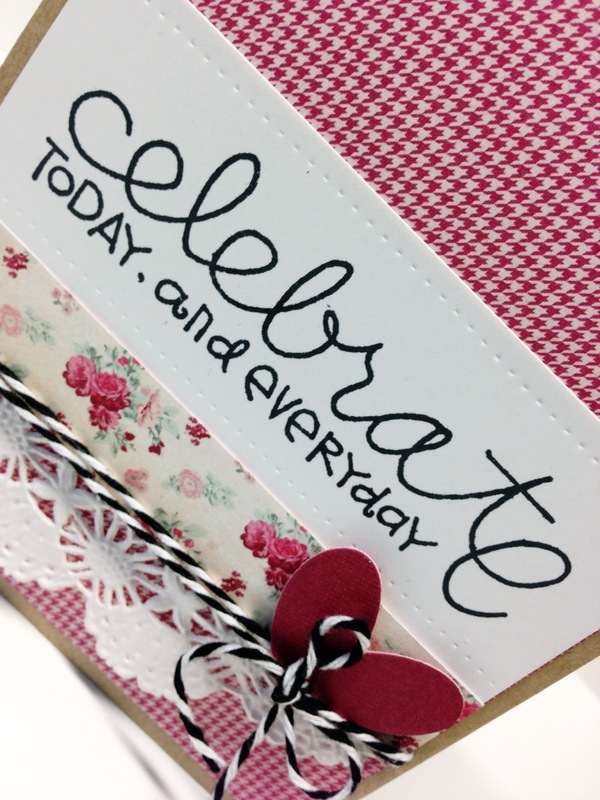 The button card is a stamp from Unity Stamp Co and the birthday sentiment is from Paper Smooches. The twine is from May Arts and the lace trim is from Hero Arts. The heart dies are from Lil' Inker Designs and the button dies are from My Favorite Things. I love how they all come together on this card. Here's a close up of the button card with the die cuts. I'm linking this card to the Unity Friends with Flair challenge. You can find that post here. My brother is celebrating his birthday today. It's a milestone birthday (50th) but I decided to leave his age off of the card. 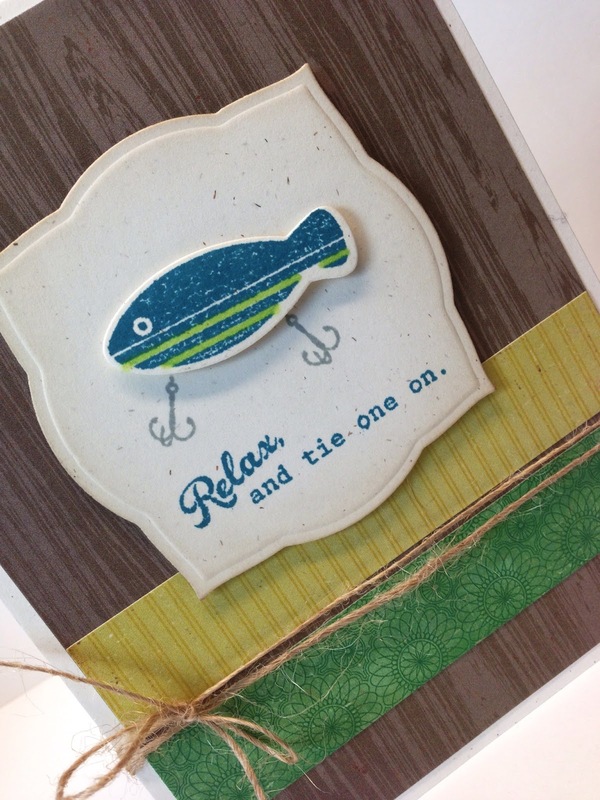 I went with a fishing theme and used the Fish More stamps and dies from W Plus 9. The papers are from My Mind's Eye and the die cut is from Nestabilities Labels 3. The inside of the card was finished off with some designer paper and stamping. The lures were stamped on the woodgrain strip and then a birthday sentiment was added for the finishing touch. The Happy Birthday sentiment is from Papertrey Ink. 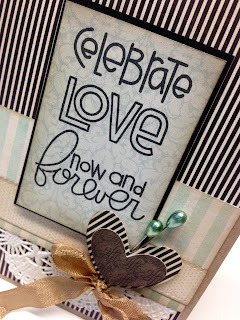 I used three stamp sets from Paper Smooches to create this sentiment panel - Celebrate from Sentiment Sampler, Love from Word Salad, Now and Forever from Simply Said. The papers are from the My Mind's Eye Lost and Found 2 Blush collection. 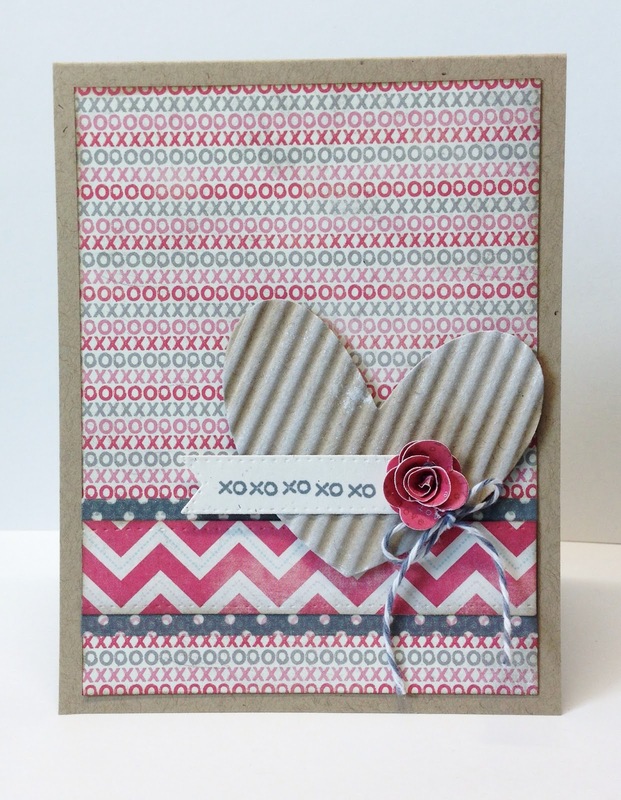 I also added a couple of die cut hearts (die from Clear and Simple Stamps), pearl pins, and some ribbon. 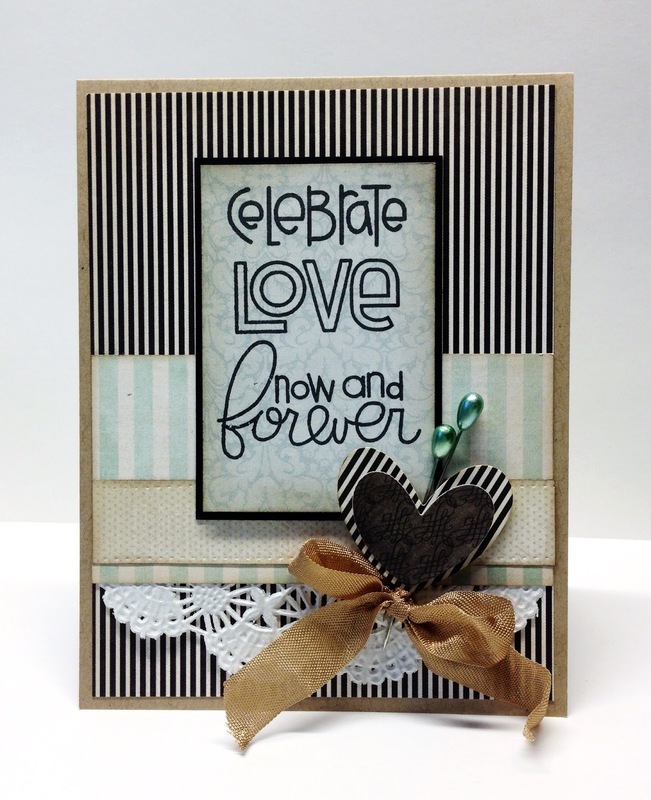 After seeing several cute cards that used the chalkboard technique, I had to give it a try so I pulled out some black cardstock, white embossing powder, white ink and some Paper Smooches stamps. I stamped the branch and bat with Frost White Colorbox pigment ink and heat embossed it with white embossing powder. 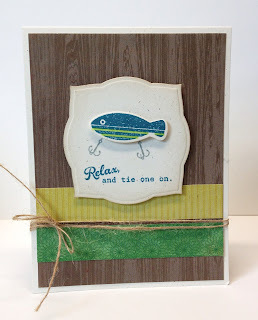 I stamped the images slightly off center a second time with the white pigment ink, added a border to the piece with a white colored pencil and then swiped my white pigment ink pad around the edges of the piece to complete the chalkboard look. I'm definitely going to try this technique again. The patterned papers are from the 6x6 Love Me pad from My Mind's Eye. The heart was die cut with Clear and Simple stamps heart die and then run through my crimper to give it some texture. 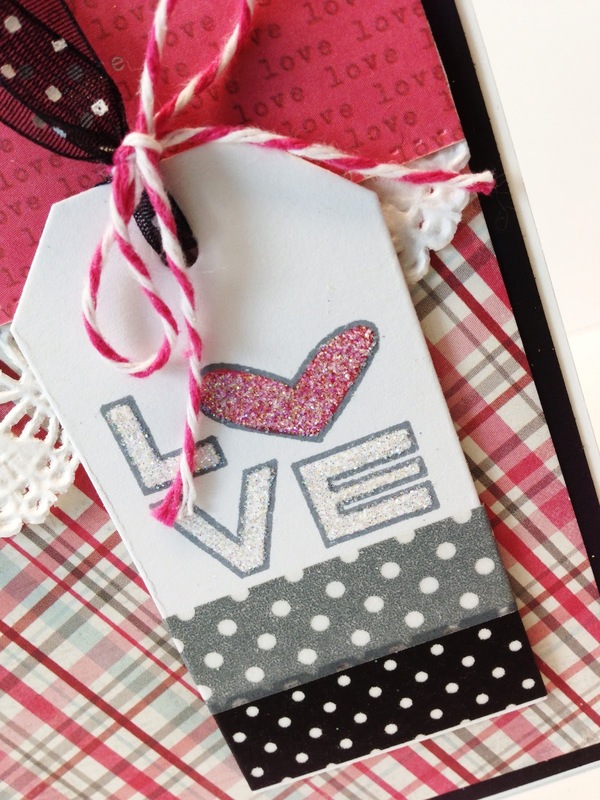 I stamped the sentiment on a strip of kraft cardstock and mounted it on the heart. For the finishing touch, I wrapped some May Arts burlap string around the card. The images are all from Kim Hughes. The branch is from an old rubber set from her time with Cornish Heritage Farms. The bat and sentiment are from her Paper Smooches Falling For You set. 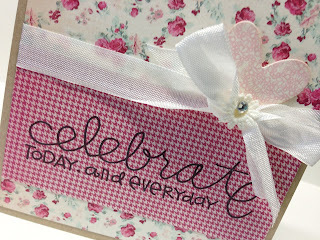 Today I have some cards to share with you that use the My Mind's Eye - Lost and Found 2 - Blush 6x6 collection. My friend, Kim Howard and I challenged each other to make some cards using that collection since we both happened to have it in our collection of 6x6 pads. I ended up using up my paper pad and making over 20 cards so today I will share five of the cards with you. All of these cards have sentiments from Paper Smooches. For the first card, I stamped the LOVE sentiment from Paper Smooches Good Gab set and colored the letter with a Copic. I paper pieced the heart. The flowers were punched with an EK Success punch and paper from the Blush collection. I added Queen & Co pearls to the center. I added several flowers to this card and then added the label piece which was cut out from another piece of paper from the collection. 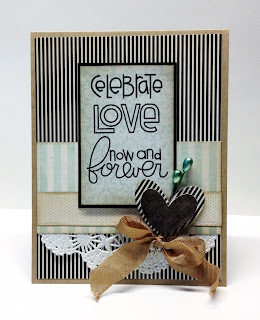 I stamped the LOVE sentiment from Paper Smooches Word Salad set and colored it with a Copic. For the finish touch I tied some linen thread around the card. 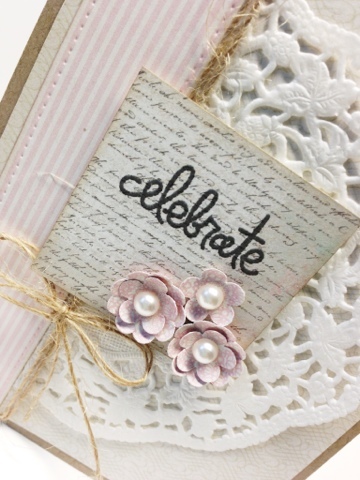 Card three has an embossed sentiment, some pearls, a piece of paper doily and die cut hearts. 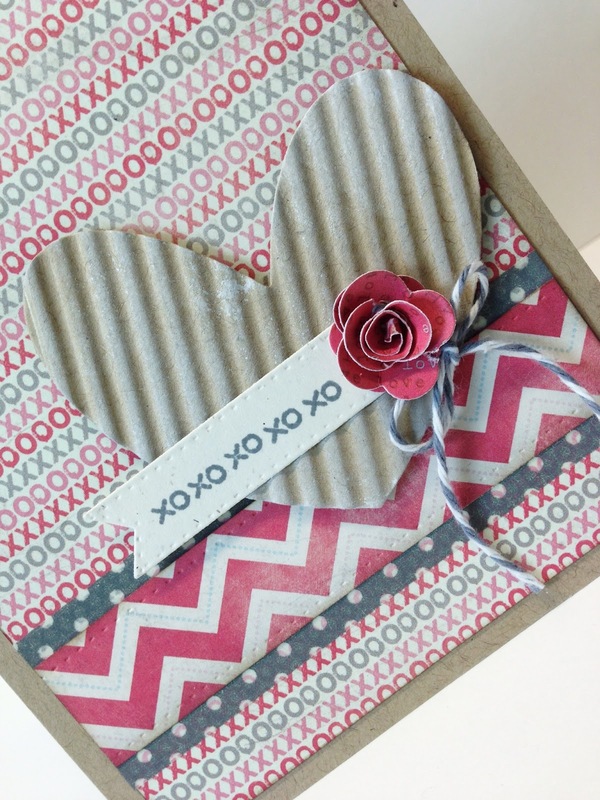 The sentiment is from Paper Smooches Simply Said set and the hearts are die cuts from Clear and Simple Stamps. I'm always in need of belated birthday cards. Despite the fact that I make cards all the time, I'm not very good about getting them in the mail so I thought I would add one to my collection of cards. 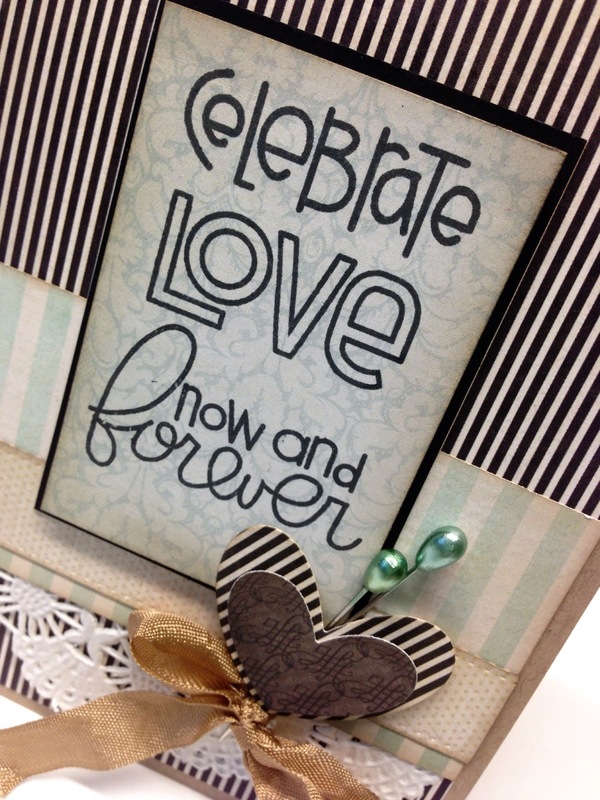 The sentiment is from Paper Smooches Word Salad set. I added more of the same flowers like on the first card and some burlap twine from May Arts. Finally, I made a very simple congratulations card to have on hand. The sentiment is from Paper Smooches Simply Said set. I added more May Arts burlap string, some punched flowers and a scallop border that was a die cut from AMuseStudios. Thanks so much for stopping by and checking out my challenge cards. Don't forget to check out Kim's blog now. I can't wait to see what she came up with for the challenge. For today's card I went with more of the Blush papers from My Mind's Eye. I also used a paper doily and some May Arts string. The sentiment is from Paper Smooches. 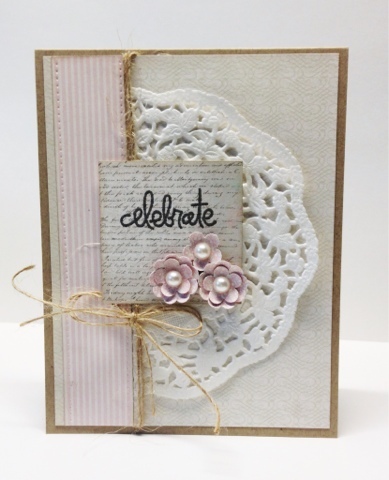 I made the flower embellishments with an EK Success flower punch and a Cuttlebug flower die. I added Queen & Co pearls to the centers. Today's card uses the negative die cut piece from yesterday's card. After die cutting the leaves for yesterday's card, I saved the piece and added some text printed paper to the backside of the black polka dot piece and then added some flowers. The sentiment is from Paper Smooches Good Gab set. For the finishing touch I added a piece of paper doily. The papers for today's card are also from the My Mind's Eye Blush 6x6 pad. Here's a closeup of the die cut leaves and flower detail. The card I have to share today will be perfect for Valentine's Day. I used papers from My Mind's Eye Blush 6x6 pad, a set of Cuttlebug flower dies, Spellbinders heart and scalloped heart Nestabilities, a flag die from Lil' Inker Designs, a Stampin Up leaf die, some Queen and Company pearls and a sentiment from Paper Smooches Word Salad set.